The Question:I saw the most gorgeous hotel posted on Facebook, but the comment associated with it didn’t identify what hotel it was or where it was located in the world. I want to know. In fact, I sent you a link to the post. 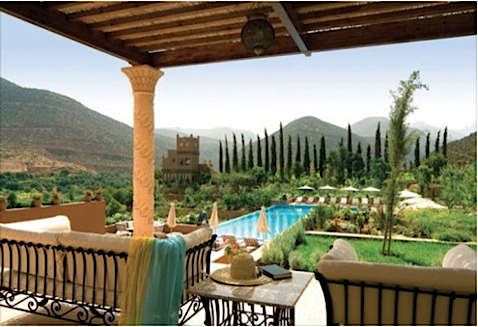 Can you figure out where the photo was taken and what hotel it is? There are no tools on Facebook to help identify photos but it turns out that Google Image Search has all sorts of amazing capabilities, including the ability to find matches online for an image that you upload. The end result being that it’s a simple and effective way to identify photos in situations like this. Actually, it’s not entirely clear that it is a hotel, it might just be the back patio and pool of an estate somewhere. For which I’ll have total estate envy: my yard definitely does not look like that! You can see that there’s no information, which is why we’re left guessing. 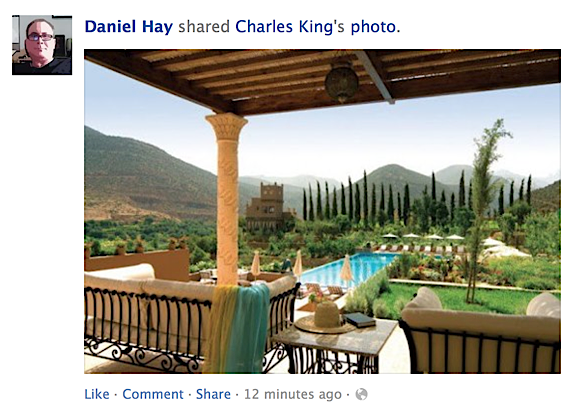 Daniel shared Charles’ photo, but neither of them added a caption telling us where it is. It happens. To proceed, I recommend getting a larger version of the image, so click on it so the photo is shown in gallery view. Then use your favorite screen capture utility to grab a copy of the image and save it to your desktop (dragging it probably won’t work). On a Mac use Cmd-Shift-4 and then click and drag to define a region that’s the photo and nothing else. On a PC use Shift-PrtScrn then open Paint, paste the copied image, and save it as a new file). Ask Dave Taylor facebook. permalink.